MSC Cruises приравнивает своё членство в соответствии с членством туроператоров, авиакомпаний, отельных сетей, других круизных компаний. Можно послать заявку с указанием своего уровня в другом клубе, доказательством служит фотография карточки или скриншот из личного кабинета (файл с изображением нужно прикрепить к заявке при заполнении формы). Членство в разных клубах не скалдывается, поэтому выбирайте тот клуб, в котором ваш статус наиболее высок. * MSC Cruises will only consider benefit cards from other Cruising companies, Hotels and/or Tour Operators. Airline Company benefit cards are excluded. 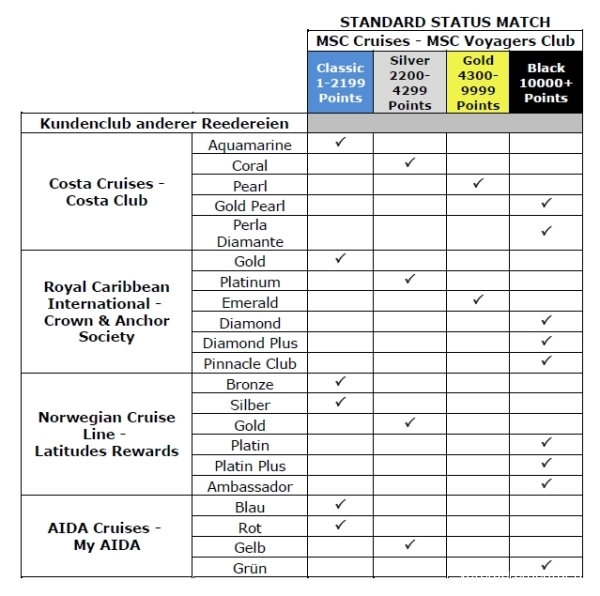 * Matching is carried out by comparing as much as reasonably possible the level of benefits guaranteed from the external travel program benefit card with those offered by the MSC Voyagers Club cards (Conversion will be executed by MSC Cruises based on MSC Cruises criteria and may only be done once per consumer). Clients will physically receive their membership card once on-board for their first cruise with MSC Cruises. It is not possible to combine MSC Voyagers Club points with points from the benefit card data of other companies. If your client has benefit cards with multiple companies, he/she will have to choose which card to use to take part in the promotion. The MSC Voyagers Club card and membership will be subject to the terms and conditions of the MSC Voyagers Club. A copy of the MSC Voyagers Club T&Cs is available at the travel agency and on the MSC Cruises website. Таблица соответствия статусов для некоторых круизных компаний.